You might say this is actually Sue's world, and we're all just temporary playmates passing through it. 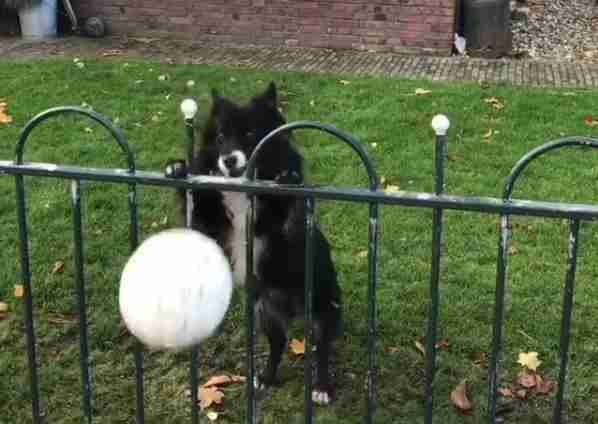 The remarkably bright border collie in the Netherlands has figured out a clever way to trick humanity into giving her exactly what she wants - and what Sue wants is an endless game of fetch. Her ploy is actually quite simple: she tosses her ball over the fence and waits for people passing by, acting as though she lost it. When they throw the ball back, she gets to chase it. Then she tosses the ball back over the fence again and the process repeats. Most folks probably never realized they'd even be duped into her game at all ... but this video proves Sue knows exactly what she's doing. Footage taken from another angle shows just how easy it is for some well-meaning stranger to get trapped by Sue's fetch in perpetuum. I mean, you gotta toss the ball back, am I right? Now, it might be natural to suspect that Sue is merely trying to cope with the boredom of being stuck outdoors. "She's done this since she was a puppy," Sue's owner, Kelly Dobbe, told The Dodo. "She barks in the morning at the door to go outside, then wants to stay until 6 pm when she gets hungry and tired. She is sad when it's raining, because she can't play outside." Best of all, Sue is able to find plenty of participants to her little game, as seen in the clip above. "In the beginning, I was surprised, but now it's so normal," Dobbe said. "During the weekend it is very busy at the fence. Sometimes cars also stop to throw the ball back." Well played, pup. Well played. Click here to follow Sue on Instagram.